At a recent Senate Banking Committee hearing, Senator Robert Menendez of New Jersey, responding to comments about large transit subsidies, remarked that the last federal highway bill included $200 billion in subsidies for highways. The Senator should know better. The federal highway bill builds highways with fees paid by highway users, not by subsidies. Perhaps the Senator was frustrated at having just heard an effective fact-based dismantling of transit lore in testimony by the Cato Institute’s Randal O’Toole and felt it necessary to strike out at the mode by which nearly all travel occurs in the United States. In fact, virtually all of Senator Menendez’s $200 billion for federal highway spending come from user fees, which are paid by people and companies that use the highways, not subsidies. The Menendez comment might simply result from ignorance. But often the error appears to be the purposeful muddying of an issue that has become so common in public affairs. The “subsidy” litany is accepted by many in the public, who have better things to do than to check the veracity of statements by public “servants”. As a result, we offer this primer on the subject, not only for casual observers of public policy, but also for any members of Congress who might have an interest in veracity. A government subsidy occurs when taxpayers are forced to pay for a government service, whether or not they use it. Subsidies are legitimate. Subsidies are needed to fund government services demanded by the electorate, such as welfare services and education. On the other hand, payments made by users of a government service (or private goods and services) in proportion to their use are not subsidies. They are user fees, including taxes on the use of gasoline and other fuels. This point can be illustrated by looking at the electricity industry. No one would suggest that Potomac Power, Pacific Gas and Electric or other privately owned utilities that are supported by payments from consumers are subsidized. Similarly, government owned utilities like the Los Angeles Department of Water and Power, Austin Energy and the Tennessee Valley Authority are not subsidized, since they receive their funds from users. It would have been no more absurd to characterize user payments to electricity companies as subsidies than to characterize the federal highway program as subsidized (Note 1). There is a simple way to tell the difference between subsidies and user payments. With subsidies you pay whether or not you use the service. In contrast, with user fees, you don’t pay if you don’t use. People who don’t use electricity from the Los Angeles Department of Water and Power don’t pay and people who don’t use the highways don’t pay either. Everyone agrees that transit is subsidized. Approximately one-quarter of transit’s operating and capital funding comes from passenger fares. Nearly all of the rest is subsidies. Moreover, an “open and shut” case can be made for subsidies to transit as a welfare service in core cities where it provides the only mobility for some lower-income residents who do not have access to cars. The case is, however, less than “open and shut” with respect to the substantial subsidies for upper-middle income commuters such as those from Connecticut, the Hudson Valley and New Jersey to Manhattan, or from tony East Bay suburbs to San Francisco, or for well-paid Maryland and Virginia commuters into the District of Columbia. A 2004 United States Department of Transportation (USDOT) report indicated that federal subsidies to transit amounted to $0.16 per passenger mile in 2002. 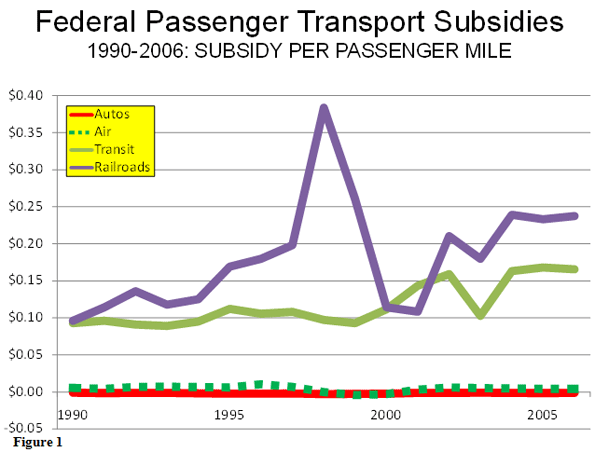 Our update of this report estimated that the federal subsidy had risen to $0.17 per passenger mile by 2006. Overall, federal subsidies to transit were $7.7 billion in 2002, which increased to $8.6 billion in 2006 (Figure 1). Virtually all federal highway spending was financed by fees paid by users in proportion to their use of the highways. There was no taxpayer subsidy. Indeed, the USDOT report indicates that in 2002, the federal government made a profit on automobile use of highways of $0.001 and had made a profit in every year since 1990, the first year reported upon. Overall, automobile use of the highways earned the federal government a profit of $4.5 billion in 2002 and $5.5 billion in 2006 (Figure 1). The profits made by the federal government on highways indicate that highways are, in fact, subsidizing other government services. Senator Menendez neglected to mention, of course, that last highway bill (called “SAFETEA-LU,” its predecessor was called “ISTEA,” pronounced by insiders as “ice tea”) included $34 billion in subsidies by highway users for transit. For more than 25 years, federal law has required an add-on to highway user fees to support transit. 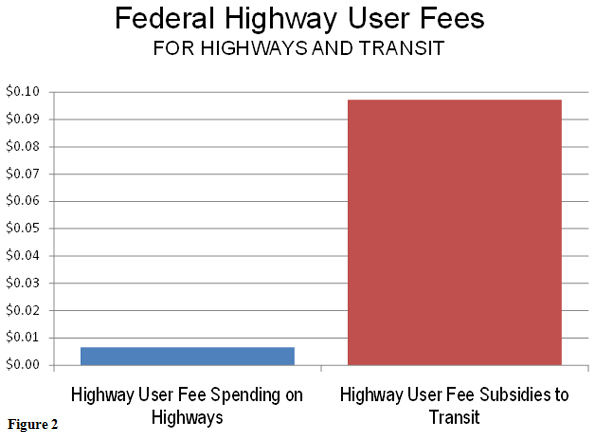 Today nearly 15 percent of highway user fees are used to subsidize transit. In fact, road users pay 15 times as much in gas taxes per passenger mile on transit as they paid for highway expenditures (Figure 2). The profits do not stop at the federal level. Federal Highway Administration data indicates that user fees exceed the federal and state share of money spent on state highways, these being intercity highways, urban freeways and some other urban roadways. Only at the local government level are expenditures more than highway user fees, indicating subsidy. A real world parallel: Most of us have had Starbucks coffee. Our Starbucks coffee is not subsidized; rather we pay for it, 100% of it (Note 2). We can call this a price or we can use the public policy synonym, a user fee. As in the case of highways, those who do not drink Starbucks coffee do not pay for it. However, if Starbucks were financed like the federal highway program, 15 percent of the price of the coffee would be taken to subsidize tea drinkers (the authorizing legislation might be called ICECAFE). While Senator Menendez did not refer to airports, those afflicted with a love affair with trains frequently claim that airports are subsidized in order to argue for massive expenditures on high speed rail, intercity rail and Amtrak. They are nearly as wrong as Senator Menendez. The air transportation system is overwhelmingly paid for by users, through taxes on tickets and airport fees. As in the case of highways, only those who use airports and the commercial air system pay for them. There are relatively small subsidies to commercial air transportation. The USDOT report found subsidies per passenger mile of approximately one-half penny. By comparison, the nation’s intercity passenger rail system (Amtrak) was subsidized to the extent of $0.21 per passenger mile in 2002, according to the USDOT report. Our report found that the figure had edged up to $0.24 in 2006, more than 50 times the subsidy to the commercial air system (Figure 1). These commercial air subsidies, however small, should be eliminated. Failing that, train proponents have grounds to ask for up to a half-penny per passenger mile of subsidy for high speed rail and intercity rail. Beyond that, equity requires that high speed rail and intercity rail be financed the same way as the commercial air system: with passenger fares, taxes on rail tickets and fees for the use of railroad stations. The bottom line is that you pay for your coffee from Starbucks, you pay for your electricity from the Los Angeles Department of Water and Power and you pay for your federal highways with your own money, not with subsidies by people who do not use them. Note 1: Of course, if general taxpayer funding is provided to electric utilities, such payments would be subsidies, whether the utility is privately owned or owned by government. Note 2: All of this assumes that the local Starbucks is not the recipient of special tax incentives or abatements that might have been used by local government as enticement to locate in the community. Submitted by Greg Critser on Sun, 07/19/2009 - 11:58. As soon as you see someone characterizing CATO as effective and fact based, you know where the article is headed--into the ideological wastebin. Submitted by lovercathi on Tue, 12/07/2010 - 09:19. I would like to at least be given the chance to buy some car insurance quotes if already the highways I'm transiting are very very expensive. Won't this administration think of it's citizens ? Sometimes I think we're all being ignored over and over again. what about costs borne by the public? Submitted by peter on Fri, 07/17/2009 - 12:56. The public subsidizes highway use in a lot of ways besides highway construction. Who pays for the costs of air pollution, smog, noise, and greenhouse gases emitted by highway usage? Who pays for the medical costs of car accidents with uninsured or underinsured drivers, or non-drivers? Who pays for the highway patrol? Who pays for the use of public land given over exclusively to highway users? Who pays for the pollution caused by oil refineries and the auto industry? The fact is that highway users place enormous costs on the public as a whole. It's hard to put dollar values on these costs, but I'd venture that gas taxes cover only a fraction of the real cost of the highway system. I think so-called "highway user fees" need to be much higher than they are now. Submitted by arlington on Fri, 07/17/2009 - 15:50. "Who pays for the costs of air pollution, smog, noise, and greenhouse gases emitted by highway usage?" Same people who pay for pollution from electricity plants powering transit systems, NTSB investigations into rail crashes, operating costs of running nearly empty trains in order to maintain 10 minute headways. Submitted by Tom_Harned on Fri, 07/17/2009 - 08:59. Please go up to any governor or legislator (federal or state) and politely tell them that they don't have to worry about funding highways because it's all user paid, and doesn't involve subsidies. They'll rightly laugh in your face. Whether you advocate for highways or transit, transportation in this country is almost never self-sustaining, it relies on revenue from a number of different sources. Transportation infrastructure is an investment and a public good, and one that most people in this country are willing to pay for. Ballot initiatives for funding infrastructure improvements, whether they be for transit, highways, sewer, etc. tend to get approved by voters at very high rates. You also fail to mention that subsidies that go to transit can result in significant benefits to drivers. Think about what the congestion on the highways leading into New York would look like with the extensive commuter rail lines serving the city. You're looking at the different transportation modes as if they don't impact one another, which is patently false. I would suspect you know all of this though. After all you're a relatively intelligent person and particularly good a twisting facts when it suits your needs. While you claim to listen to the numbers and make data-based decisions, you are perhaps the most ideologically driven contributor on this site. Maybe you need Joel Kotkin or Sam Stanley to give you a quick lesson in proper research techniques. While I don't always agree with their arguments, their research tends to be of a very high quality and brings up some important points that I would have missed otherwise, whereas you seem like you would be more at home writing for the National Review. Submitted by arlington on Fri, 07/17/2009 - 10:53. Transport construction and maintenance has to be subsidized by taxpayers, regardless of whether its trains, roads, or otherwise. User fees, whether they're gas taxes or farebox collections, never cover total costs. Cost of construction crews is not dropping, and many of the same construction companies laying tar for new roads are also putting down spikes and ties for light rail systems. And they don't run around quoting Jane Jacobs or Lewis Mumford in their contract proposals, the left/right ideology that goes into many of these classroom discussions is far removed from any reality. With pax rails, the economics are actually worse than airlines. In DC, our Metro system has a capital expenditure/revenue ratio of 1. Few private businesses can survive spending a quarter of that level. So the thing, as well as Amtrak, will also need heavy subsidies, regardless of what political ideology gov't officials subscribe to. The tipping point between more rail vs. more road is ultimately tied to the cost and density of land area, because rail can handle more people per square mile, but requires far more recurring capital outlays. You wouldn't have all these new light rail projects popping up on public rights-of-way if it hadn't gotten so expensive to condemn the large amounts of private land needed for metro highway projects. Because it's gotten cost prohibitive to build new freeways in many metro areas, you'll probably see more new suburban rail lines relative to interstates than there have been in the past. But most of these transit systems won't carry more than 10% of all commuters. However, the composition of that 10% will constantly change, with many people choosing road one day, rail the next based on their daily schedule. I know a lot of people here who mix up their commutes, and the top factors that go into their daily rail/road decisions are day care pickups, mid-day sales meetings, and little league games, not political ideology. Submitted by wes on Thu, 07/16/2009 - 23:16. Much of this post touches on the numbers of subsidies from the federal level - which is only telling of a portion of the picture. This piece further only mentions but one aspect of "subsidization", and that's direct costs. Highways in the US are never completely covered in "user fee" cost, but you can certainly make it look that way by only using the federal numbers regarding subsidization. "Federal Highway Administration data indicates that user fees exceed the federal and state share of money spent on state highways, these being intercity highways, urban freeways and some other urban roadways. Only at the local government level are expenditures more than highway user fees, indicating subsidy." Submitted by Wendell Cox on Fri, 07/17/2009 - 10:30. Wes... Exactly my point. 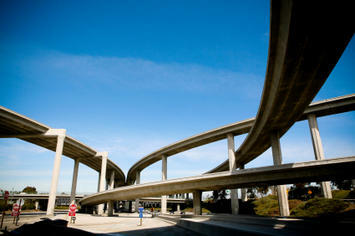 Intercity and urban highways funded at the state and federal level cover their costs from user fees. The chart you refer to demonstrates that (and was used in my research). At the local road level, however, there are subsidies. Submitted by wes on Fri, 07/17/2009 - 13:00. It's not that there are subsidies at the local level, it's that total federal, state and local non-user fees are about $55 billion for 2007! General fund appropriation alone is 32 billion. You mentioned that local governments subsidized highways, but you forgot to mention they were the biggest player in highway subsidization. This is also just for highways - not the local/arterial roads that lead to the highways, roads that certainly used a portion of non-user fees for their construction and maintenance. Furthermore, this is also discounting the environmental and municipal safety service subsidies that all automobiles receive. I will reiterate that you have merely scratched the surface regarding subsidies, and I feel that you tried to use mostly federal numbers to skate around the issue at hand. Federal subsidization would be more if it didn't have the local government payments. It may very well be that transit subsidization is a major issue, but most of us would appreciate a more thorough and unbiased discussion of the topic at hand.